Three days ago I got a cough and fever, and it makes me not able to go anywhere, Now my body is recovered and I could go to see the sunset in my favorite place, and this what I wore, maybe it's kinda weird 'cause I wearin a colourful outfit on my post now. This blazer actually gonna be my favorite since I got in on Ericdress, my new favorite site, simpy click here if you curious about it. 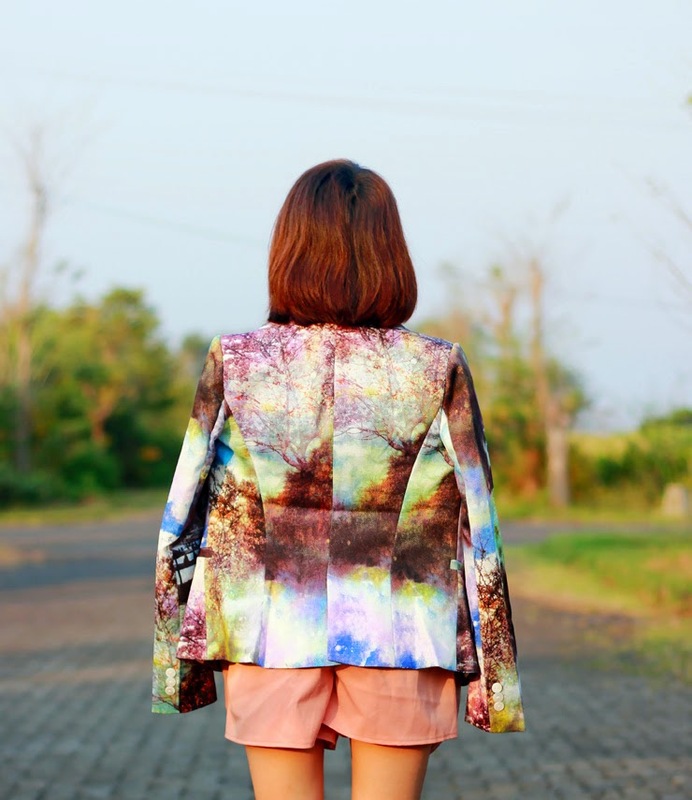 I really love the print on my blazer, the texture, oh everything about it, I try to wear it with my pastel short and my gold heels. Feel so girly today 'cause I always wear boots and sneakers these days. So lazy to curly my short hair too, so I let it straight. I want those shoes! badly! I'm glad you're feeling better again! Marvelous look. Love the cute blazer! In love with this blazer and entire fantastic look! Gorgeous! That jacket is super pretty. Love the cool jacket and you look amazing!! I wish I can meet you, living-Barbie! I really like your skort and the blazer, and your hair and make up are just amazing! That blazer is so cool! And your hair looks awesome! love your whole look rin! WOW!!! love the jacket and you look amazing! So pretty! Love your look ! Stunning jacket! I love the combo with the skirt! You are so gorgeous and this outfit is to die for!